Despite the fact that I still haven’t really taken inventory of my wardrobe (all I got so far is a heap of too small pants and a coat sitting on my dresser) I have been starting to look at clothes. Because even though I don’t know how many of the t-shirts in my closets don’t fit me anymore I can honestly say that I’m under-equipped with summer wear. Because yesterday when it was really, really hot I almost resigned myself to wear two things that don’t match so that every important part of me could be covered without bursting into flame. And then I remembered the tank top I bought last year, and I was really, really happy. You know, a tank top that does not pinch anywhere, and that doesn’t exactly make me look like I’m going to burst it any second now. That doesn’t mean the tank is looking good on me, and that doesn’t mean that I have shorts or a skirt or pants that really go with it, so yesterday I went with the too big grey linen pants (you know the kind that older women wear in summer when they don’t want to expose their legs), and a brown tank that didn’t really go with it. So I got out my sewing magazines, and started looking for dresses and skirts (and pants, and shorts (only there weren’t any, and coats) for plus sizes. And I looked at the patterns, and at the model, and starting thinking about making a jersey wrap dress when it hit me. All of these patterns, every single one is made for “apple-shaped” women. Bit bust, nice legs. 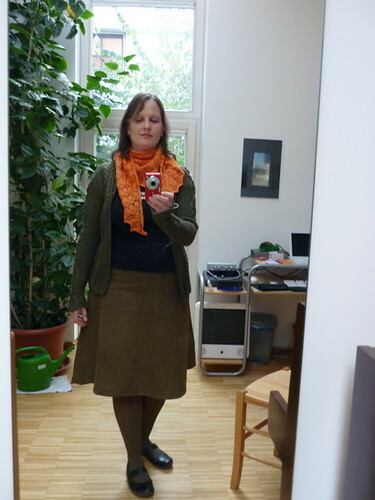 Me, on the other hand, I’m that pear-shaped that my lower half is about two sizes bigger than my upper half. I also managed to eat my midsection big enough to make people wonder if I’m pregnant again. So, none of those dresses will actually look good on me. Even if I can make them fit. My next thought was that there are stores for people like me, those who don’t fit into the “normal” sizes, and then I thought back to the last time I had to shop in the “plus section”, and I remembered. It’s all the same. If you’re pear-shaped you’re doomed. So, what to do now? Change the size on some regular pattern? The clothes would end up being too short anyway. And I do have the feeling that patterns for “normal” sizes are meant for women with neither bust nor hips so that won’t work either. Maybe I should make my own pattern but I’d have to do it quite fast. Anyone knows a place where to find nice clothes, plus size, fashionable, for people who are tall? And if they are not expensive, that would help too. Some might say I should just lose the weight, and I’m working on it but me thinks I can’t go naked in the meantime. It’s International Wear A Dress Day! And I’m wearing a skirt. A crinkled one that needs ironing. I need to have a haircut, the jacket needs a zipper, and in real life the jacket and skirt do match. And the skirt needs darts, and needs to be a little less full. I know. I really wanted to wear a dress but the only one I own is a summer dress. I didn’t feel like explaining to everyone I meet why I wear a summer dress right now. Pants are more comfortable than skirts (or dresses). Well. There are people who think differently, first among them the gorgeous Erin who declared today to be International Wear A Dress Day. Also Isabo whose post you should read (and probably already have) when you understand German. And I went on about my day, and all of a sudden I started realizing that I’m constantly pulling on the waist of my pants. You know, when I say that I have two pairs of jeans that fit this means that I can close them all the way, I can wear them in public without feeling embarrassed, and they are about the right length, that’s all. The length issue is the reason why I only own jeans but no dress pants or anything. Because jeans come in different lengths, and some of them will be 34″ and so these will fit me. Most pants are simply too short for me. 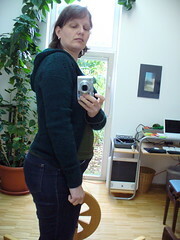 Both of my jeans though have to be pulled up every time I sit down, or get up, or bend over, or move in any way. When I complained about this to my husband he said, “Why don’t you wear a belt?” Well, for several reasons: 1) It’s hard to find a belt that fits me. 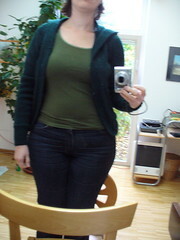 2) My jeans – while being to wide in the waist – still manage to pinch me in the belly area. Belts only make this worse. 3) The belt then will be pulled down in the back as well which makes the whole thing really uncomfortable when sitting down. 4) Because of the belly situation (and because I don’t want to look really ridiculous) I can’t pull the belt tight enough to have the pants actually stay up where they belong. See, I need the back of my pants to be several centimeters higher than the front. Not everybody does, and so pants manufacturers usually don’t accommodate my need. I also need the waist to be two sizes smaller than the hips. Again, not everybody needs this. I already spoke about my long legs, and in addition to this I need my pants (or anything for the bottom of my body) in a plus size. Oops. Very well. So now how does this make pants more comfortable than dresses or skirts? It doesn’t. I have this very comfortable, sturdy, practical, and not dressy skirt. And I can easily make more, all it took was two ours, a zipper, and a bit of fabric. The two things that make skirts uncomfortable then are: tights and shoes. I usually despise tights because they never fit (same issues as with pants only they pinch at the toes as well), they are really breakable. And they never fit. Usually I’m left with ladders everywhere while the top part of my pantyhose tries to meet my knees while still managing to pinch my belly. But. I found a brand of tights that fit! I found them totally by accident because I wanted to wear my summer skirt, and all of my tights were full of ladders, and so I had to buy new ones locally and they were really more expensive than I feel comfortable with but: THEY FIT!! No pinching, no sagging, no nothing. Bliss. The next problem is the shoes. I follow a strict “no heels”-policy, and I also refuse to wear shoes that I can’t walk a couple of miles in without feeling pain. This means that mostly I’m wearing walking sneakers. 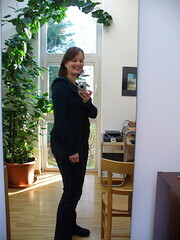 Not pretty, I always have this soccer mom look but still, I can walk for hours without any problems. I bought myself some cute Mary Janes (the ones you might get a glimpse of in the picture above) but while they feel comfortable when I’m sitting still they start chafing the minute I take a step or two. I have declared them to be my indoor skirt shoes for teaching. The comfortable pair of Mary Janes is red and ugly. You know what I need to do? Buy shoes. I’m thinking of some flat lace-up boots. Has anybody any experience with knee-high Doc Martens? I have really, um, voluptuous calves. There might be some boots that fit over my ankles but almost none that I can close all the way to the top. I know that there are custom boots available but really, I’d rather spend my money elsewhere. On the other hand, think of all the money I could save if I no longer had to buy really expensive pairs of jeans that get holes after six months (no kidding). I can whip up skirts in almost no time, I could even add lining and pockets (because that’s something I don’t like about skirts too, no pockets, but then – if you make your own…), and fabric and zippers is not that expensive. Okay. the skirts won. Especially when I don’t think about what I think I should wear a skirt with but just wear hoodies (that’s Vivian without a zipper), and silly tees (it says, “Schrödinger’s cat is dead” on the front and “Schrödinger’s cat is not dead” on the back) and comfortable shoes. So what do you think? Do you like wearing skirts and dresses? Or pants? Or both? Excuse me, I have to go look for shoes. And a coat. And fabric. And more tights. Some of you might ask, “What’s a gauge swatch?”, well, I wrote about this particular gauge swatch way back in March. (A gauge swatch, by the way, and for those of you who really don’t know, is when you knit a small piece of about 10 x 10 cm or 4 x 4 inches to determine what size needles to use, and how many stitches you will need for the thing you intend to make.) The swatching for this particular sweater was the most extensive I have ever done. I knit a long piece of fabric with three different sizes of needles, measured all the parts to determine how many stitches and rows gave me 10 cm, then I washed and blocked it, let it dry and measured again. And I had something of a revelation because after washing everything was much bigger than before. With the needles that I used I had 16 stitches and 23 rows on 4 inches pre-washing, and 15 stitches and 20 rows after washing. You’d think that isn’t much, won’t you? What’s a measly stitch? Let’s see: for this particular sweater I cast on 141 stitches. 141 divided by 16 is 8.8 that is 88 cm. And trust me, that is not enough to fit me. But after washing it’s 141 divided by 15, and that is 9.4 which is 94 cm, much better. So just by washing the sweater and blocking it it would become 6 cm (or 2.3″) wider. That’s how much difference the measly stitch makes. So, back to the actual sweater. I did everything right, I swatched, and measured, and washed, and measured, and chose a size that would hopefully fit me, and then I knit the whole thing in one piece instead of making a lot of weirdly shaped pieces that have to be sewn together. 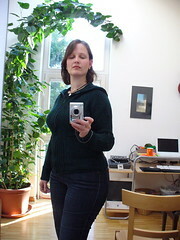 The sweater is quite fitted, and the designer obviously isn’t afraid of sewing everything on, including the buttonbands. (It’s the L’il Red Riding Hoodie by Jennifer Stafford, by the way.) And while I do love the design, and while I’m certainly not afraid of seaming, I don’t like it much, it always looks wonky, and I stubbornly refuse to sew together a raglan. Raglan yokes are meant to be knit in one piece. Of course it took more than a month before I even bought a zipper. I managed to wash and block the sweater, and, alas, finally it matched the intended dimensions. For months I had been sure it was all a mistake, and I’d end up with a hoodie fit only for my son. I even worried about what to do about the waist shaping and bust darts, something he really has no need for. I carefully measured the hoodie, went to the store with my huge gauge swatch for color-reference and bought a zipper. When I came home I immediately was sure that the zipper was too long. Also too heavy. And I didn’t know how to put a zipper into a sweater. I’d certainly not use a sewing machine but what to do? Thanks to ravelry and the internet I found two excellent tutorials, one by Grumperina and one by Claudia. I mostly followed the latter because of the, as Grumperina put it, “absolute quality in every shortcut”. I’m very keen on shortcuts when sewing (come to think of it, I like them in knitting as well, only you can’t use any in music). And I actually basted my zipper in! I never baste anything in, but finally I have been convinced to make exceptions for zippers. Some shortcuts aren’t shortcuts but time-wasters. It’s a good thing to know the difference. Also I seem to be in sweater knitting mode. I think it has something to do with several things: a) it’s becoming quite cold, b) I am a bit sick of my two winter sweaters, the red one and the terracotta one that I have been wearing all winter long for the past four years (and both of them have sleeves that are too short), c) I realized that knitting a lace stole or shawl doesn’t take more time and work than knitting a sweater but while I clearly don’t need more than four, or let’s say five, lace stoles and shawls I can easily need more than four winter sweaters. And now that I have experienced the wonders of knitting gauge swatches, and measuring them, and even of such extreme steps as looking up the measurements of the finished sweater in the pattern, and – instead of just assuming that I need something in size M – actually measuring me, and some sweater that fits, and choosing the size accordingly, well, they might even look good on me. Which is why I set out to knit a sweater in November. It’s red. I love it so far but since it’s not been washed yet it’s still too small for me. I started on November 8th, and completed it two days ago. Happy NaKniSweMo! Fashion was important. It was a grown-up thing. And from the start I learned that it was constantly in flux. Then I used my “expertise” to judge others. “I would never wear that.” “Look at her.” Once, on a subway, I stared at the woman sitting in front of me with such disdain that I made her squirm. Well, she was dressed all wrong. I’d still like to apologize to her. My own style, by the way, was not beyond judgement. Instead of cool, and also because I lacked money, I turned to eccentric, never taking fashion serious enough to really pull that off. It all culminated in neon-yellow pants with printed cartoon mice topped with a neon-yellow sweater and an enormous green silk scarf and gigantic pink glasses in the 80s. Neon colored knitted sweaters and bright, cheap earrings hanging down to my shoulders. Then I followed the lead of a friend, I grew tired of mixing pink, yellow, and green, and started to buy only classic clothes in black, red, and grey. The number of clothes I owned shrunk, but at least my style got better and I didn’t look like a clown anymore who had fallen into the sales bin at a very cheap store. Then other things got more important. I didn’t think about fashion anymore. I started to feel that I was too old to care about things like that. And I had found my style. No need to change anything. If something wore out I replaced it. And this is where I am now. I’m no longer buying fashion magazines, I find them boring. I look at other people instead. What are young women wearing? Those between 16 and 30? What of that might work for me? And in the last few weeks I have found “A Dress A Day” and “The Sartorialist“. I found them through Lia who claims to have no interest in fashion. Those two blogs have made me think different about fashion again. They are looking for the unusual, the personal, and at least Erin from “A Dress a Day” doesn’t exactly follow current mainstream fashion. Her blog is all about the deep love for vintage dresses. It happens that right now dresses are “in” again but I have the feeling that she will continue to love those dresses and wear them even when they will be out of fashion again. In the process of re-inventing myself before turning forty I also subscribed to Missus Smartypants for a brief period. You get recommendations for what to chose that is appropriate for your body type. Very helpful. Also a friend once told me I should reconsider my love of black, grey and red since I look far better in browns and such. (I wrote about that in “Color, orange …“.) And I discovered “Friday style” which is very lovely too (You just have to love somebody who writes about fashion and writes headlines as “Because healthy is always stylish.). Reading those blogs give me inspiration without having to wade through pictures of incredibly thin and badly styled models and half a magazine of ads. So, there still is a little of that quest for being cool in my interest concerning fashion. There is also a love of beautiful things. I used to go window-shopping at Munich’s most expensive fashion boutiques. I never entered one of those. I didn’t even wanted to have the clothes for me (they wouldn’t have fit anyway) but I loved looking at them. Like going to a museum. I’m still puzzled that fashion has become as important to me as it was when I was 13 or so. But then maybe this is part of midlife crisis. Who knows. Just now it gives me pleasure to think about clothes and look at them. Not that I shop a lot, I don’t. And I’m still mostly wearing jeans and tees and sneakers. But I try to chose flattering ones. And you? Are you interested in clothes? Or not? I’d love to know. 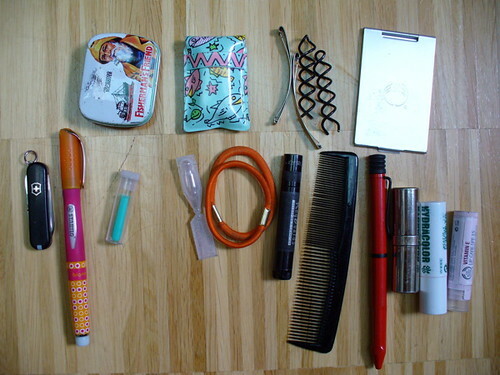 First download Amy Butler‘s yoga bag pattern. It’s free and so you suddenly find that you always needed a bag for your yoga mat. Never mind that the yoga bag travels only from the right of the computer desk to the front of the computer desk once a week. Besides, hanging the mat up on a hook would certainly lend a more professional look to your teaching room. Read the pattern about a thousand times, decide that it’s really easy to make. Convert all the inch measurements into centimeters. Measure your yoga mat thrice to ensure that the bag will be big enough. Start looking for fabric. Find the perfect exterior fabric only to find that it’s a) silk, b) 50€ per meter. 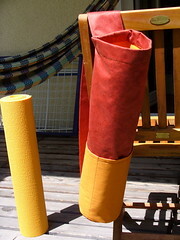 Think about making a 70€ yoga bag for about five minutes three times daily. When your mother-in-law throws the sheets out of the window that she has used to cover the floor for some renovation work, think about whether those sheets might be perfect. Decide against the colorful turquoise-and-orange-and-red-striped with elephants pattern. Go and look for the sofa cover that you put away when you threw the sofa out. Think that you have found the sofa cover which then turns out to be leftover fabric from the making of curtains last year. (That, by the way, might have been the lowest I ever sank in my “sewing career”. I was so fed up with sewing and my machine that I had them custom-made.) 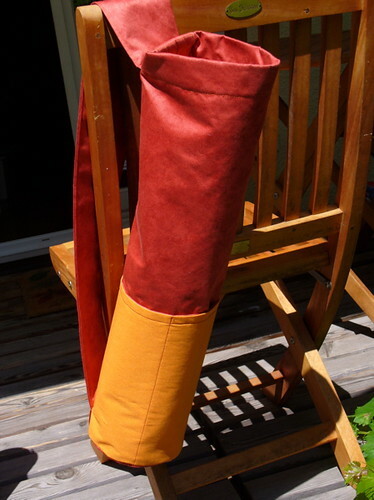 So, in order to keep the budget low, decide to make a red yoga bag instead of an orange one like you wanted. All the while look for interfacing. Think that you have very bad interfacing karma. 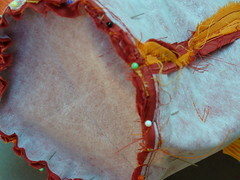 Look for at least a package of thin interfacing. There used to be dozens of these in every fabric department, but nowadays you might go to a store three times without seeing even one. When at last you see some, buy every scrap of it. Vow to buy at Lisa’s store next time. A place where when you say, “I’d like some interfacing because I’m making a bag.” the salesperson won’t look at you with a very puzzled frown and answer, “So, do you need it for appliqué?” “Um, I want to make a bag out of light fabric and I need it to strengthen…” “So, you want this then?” You, meekly, “I guess so.” Just saying. And the bonus: I wouldn’t have had to spend money on three trips to the big city. Paying the shipping from London to Germany would have been cheaper. And you can bet that if you told her what you wanted she just would have known which interfacing to use. Interfacing. I never know how much to use and which kind because, well, I lack experience and then, due to my shopping woes, I only have used the flimsy kind up until now anyway. But there is something to say for the department store I bought my fabric in because last time, when I left the store clutching my packages of flimsy interfacing and went to have a look at the sewing patterns, I caught a glimpse of interfacing on bolts! Interfacing of different thickness! Wow! Not quite the holy grail, but close. Next decide to be sensible and put your bag project aside for a month of script frenzy. In July start agonizing about it again. Think about how to cut out something that’s 121,92 cm long. Will it all work out when you round it? Should you make a pattern first? Or not? Then remember that you own a tape measure with inches on it. Decide to make a pattern. Look for some old newspaper because you’re too cheap to buy real pattern making paper. First day: Cut out paper pattern. Second day: When a student cancels a lesson, start cutting out the lining. Note that the scissors that came with your new sewing machine (more on that in another post) might be worth 47 £ to someone but not to you since they don’t exactly cut. Get out the old sewing scissors of your husband’s grandmother that you have been using as kitchen scissors for the past ten years. Sigh. Lust for a roto-cutter. Look at pictures of roto-cutters on the internet. Discuss the merit of such cutters with your sister. Decide to be sensible and frugal and use the kitchen scissors instead. Find that you still have a little time before dinner and start ironing the interface parts to the fabric. After all you decided to use flimsy interfacing on both the exterior and the lining. 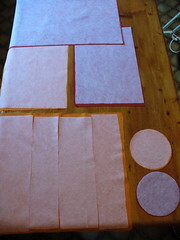 Find that you have just about enough flimsy interfacing to do this if you practice “patchwork interfacing”. Since you lost all patience when cutting out the interfacing and just did it by rule of thumb and where the scissors hit since it doesn’t really matter if the interfacing isn’t as big as the fabric, everything looks a little, um, sloppy. Remind yourself to next time turn the interfacing right side up before cutting. So when you iron your uneven and crooked pieces of interfacing to your uneven and crooked pieces of fabric at least they pretend to fit. Congratulate yourself that at least you haven’t ironed interfacing to your pressing iron. Find that you can pull off already fused interfacing from the ironing board quite easily. Use the quickly cooling iron to iron a tablecloth and a napkin. Manage to somehow put it all together. A little hint: having uneven and crooked pieces doesn’t really help with the alignment. Spend some time with your son and his friend. Cut your son’ hair when his friend is gone. Find that you still have about half an hour before dinner. Put your son in front of a DVD. 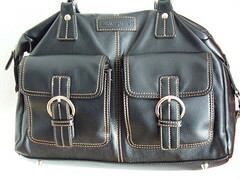 Finish bag. Keel over. Write a blog post. 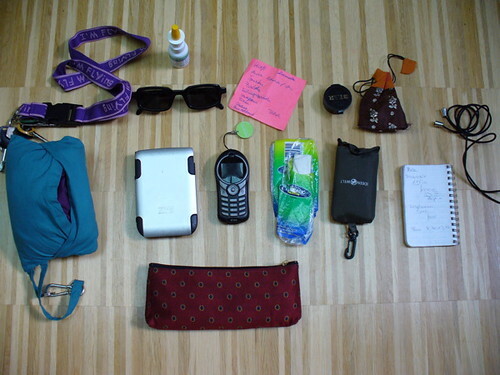 Take pictures of finished bag.